Last Fridays torrential down poor in the Portland area lead to 1000’s of gutter downspout clogs. We did the best we can to handle the demand our customers placed on us. Gutter cleaning in the Portland metro becomes “In high demand” ! during serious rainfalls. People see there gutters are overflowing. With the news media covering stories on SW Portland homes sliding down hills well we become pretty popular. I consider ourselves the front lines of holding our west hills homes down! Gutter cleaning is the most often forgotten about task to do around your home. Contact us, its free for a quote. I often go ahead a clear a clog for you too! Click here – FREE GUTTER CLEANING QUOTE. A common style downspout on new row homes. Did your basement ever flood? After a heavy rain do puddles of standing water surround your home? You can stop this from ever happening again with periodic gutter cleaning. Often made of copper or vinyl, your gutters are what protects the inside, outside, and foundation of your house from being damaged by heavy rains. If your gutters ever stop up, water can find its way into your basement and you can end up with an unwanted underground swimming pool. Architects and landscapers designers use gutters to reroute the flow of water so that it ends up in a predetermined place from which it can easily be drained. Without having these devices, even if water doesn’t find its way into your home you can still end up having to deal with pools of standing water that surround your house. Although it’s necessary to have gutters, there are design flaws within each and every one of them. The problem is that leaves and other debris can block your gutters. When that happens water can’t flow freely. In order to prevent this from happening your gutters have to be unclogged with periodic gutter cleaning. Ideally they should be cleaned both before and after any heavy rain. An added bonus is that if you keep your gutters clean you will increase their longevity. This can save you a ton of money in the long run. This is especially true if you live in a colder climate. If your gutter gets blocked and the backed-up water freezes in it, your gutters could crack. They will have to be replaced. In order to keep the water running smoothly, there’s no two ways about it, you have to keep your gutters clean. Even though gutter cleaning is a messy job there is a relatively simple way to do it. First, put a trash can on the ground below the area you’re going to clean. Next, lean a ladder up against your house and climb up to the gutter. You won’t want to go onto your roof to clean gutters because you might fall from it and could end up with a lot worse problems than having clogged gutters. A lot of people use a plastic leaf scoop to clean their gutters. They use the scoop to dig down into the gutter in order to gather up all the muck, slime, and leaves. If it’s been awhile since they’ve cleaned their gutters or if there is a big pile up of debris, a leaf scoop might not be good enough to do an adequate job. If that’s the case, many people get a pair of heavy work gloves and then try to scoop the junk out by hand. Whatever method you use, try to drop the debris directly into the trash can you set up below the area in which you’re working. This will make it a lot easier to clean up the mess after you’re done. Since the gutters are all around your home you’re going to have to climb down the ladder, move it over, move the trash can underneath where you’re cleaning, climb back up, scoop the leaves and debris out, and carefully drop it into the trash can below. Then you’ve got to repeat the process until you end up back to where you started. And, of course, you’ve got to haul the debris away. This is a very time consuming, potentially dangerous job. Because this method is so time consuming, so labor intensive, and so messy, a lot of people choose to hire a professional gutter cleaning company. Search the Internet and you will probably find a gutter cleaning company nearby your home. 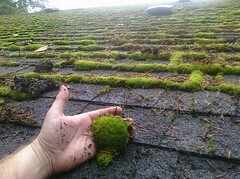 And, to find more about gutter cleaning , roof cleaning, window cleaning and more, go to www.gleamingtheview.com now.